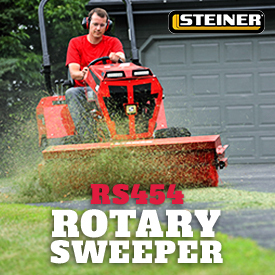 Let Steiner® do the dirty sweeping for you with the RS454 Rotary Sweeper. Use this attachment for any job, ideal for clearing away leaves, debris and light snow, or scrubbing paved surfaces. Easily clean pathways, parking lots and sidewalks with this powerful 24-in. diameter reversible sweeper. Also, hydraulic controls of the Steiner 450DX and 450 tractors angle the 54-in. wide broom left to right to sweep dirt where you want it. This four-season attachment will tackle any job you throw its way and with spring clean-up right around the corner you’ll be glad you have this attachment on your trailer.